Thomas Voeckler took his second stage win of the Tour in spectacular style in Luchon, while Bradley Wiggins kept a vice-like grip on the race lead. 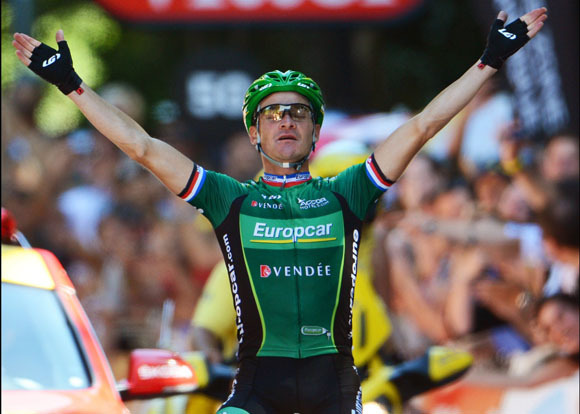 Thomas Voeckler continues to buck the trend of modern cycling, and long may he inspire others. The contrast between the battle for the daily stage honours and the race for the yellow jersey has rarely been portrayed more starkly than during the 16th stage of the Tour from Pau to Bagnères-de-Luchon. The route was the stuff of legend – covering four cols that are collectively known as the Circle of Death – and the manner of Voeckler’s victory deserves to be remembered for the daring spirit with which it was executed. But behind him, the riders at the top end of the overall classification have no such luxury because enterprise so often fails. It is not new to point out that the race for the yellow jersey is conservative and preservative. The riders in the top half dozen places are pretty evenly matched and have so few opportunities to gain time on each other. There is no way, for example, that they could attack after 22 kilometres of the most difficult Pyrenean stage of the Tour and gain eight or nine minutes as Voeckler did. Instead, the selection is made from the back, with riders falling by the wayside every four or five minutes until only the very strongest are still there. In the old days, watching the Tour was like standing back and enjoying the sight of a beautiful painting. Now it is more like looking at a set of architect’s plans. While you can admire the skill and calculation that has gone into producing the drawing, there is something cold and clinical about it. Rather than inspirational or emotive, it is functional and rational. That is not a rose-tinted view, nor is it intended to denigrate the role of sports science but it is an acceptance that flair, guile and ingenuity are less relevant to the race for the Tour de France than understanding physiology and crunching the numbers. Sky’s ingenuity takes place before the race and behind the scenes, not on the road. It is not necessarily new. Greg LeMond understood watts back in the mid-1990s. Banesto and US Postal Service distilled the Tour’s mountain stages into a rarified battle akin to placing everyone on the rack and slowly tightening the screw. So it is not a criticism of Sky to say that they did not come to this Tour with a tactical plan but with a strategy, and there is a difference. Sky’s recruitment policy has allowed them to field a team of such strength that they can dictate to the rest. Look at them on the front of the group and there’s a robotic quality to them like five Darth Vadars marching inexorably up the mountain. Don’t blame us for the analogy – it was David Millar who Tweeted a photo of Sky’s bus parked outside his hotel the other day and called it the Death Star. Besides, one of the headlines in L’Equipe this morning was ‘Le Machine Sky’. And it is not Sky’s fault that they have anticipated the challenge ahead and planned so comprehensively for it while the other teams have failed to mount a concerted challenge. The Tour has not so much highlighted the shortcomings of Vincenzo Nibali, Cadel Evans or Jurgen Van den Broeck but the shortcomings of their teams. Liquigas do not look anything like as strong as they did in the Giro d’Italia, when setting Ivan Basso up for an ultimately unsuccessful challenge, although they did try to do something today. BMC Racing are a pale imitation of Sky and they should, perhaps, have planned their Tour strategy back in the spring and followed it through in a similar way. And Lotto-Belisol, cursed by the fact that Van den Broeck shipped his chain at the wrong moment on the stage to La Planche des Belles Filles, have split objectives by offering their sprinter Andre Greipel more help than Mark Cavendish has been afforded by Sky. But that has left Van den Broeck short-handed. The logical conclusion is that other teams will copy Sky next year. They will look at Edvald Boasson Hagen, Richie Porte, Michael Rogers and Chris Froome and recognise that they need greater strength in depth and a more single-minded approach. The sort of super domestiques who fit the same moulds may find themselves more sought after, as long as they are prepared to sideline their own ambitions. Nibali tried to attack, twice, on the Peyresourde but he was not allowed any significant leeway by Froome or Wiggins, who both responded pro-actively when required. The others waited, Evans went backwards and the frustration for those who saw another L’Equipe headline over a picture of Wiggins a week ago which implored: “Attack him!” was that it simply wasn’t possible. And so the only real intrigue of the so-called ‘queen’ stage of the Tour was Voeckler’s show. It was a real show too. Escaping with a huge group of 38 riders – almost a quarter of the remaining peloton – after 22 kilometres, Voeckler made the cut every time there was an elimination. By the foot of the Col d’Aubisque the leaders were 3-40 ahead. At the top the lead had not increased much as Voeckler sprinted to take the king of the mountains points. By the time they started to climb the Col du Tourmalet, the lead was 5-35. On the climb, Dan Martin forced a little move clear from the 38, which sparked the counter move by Voeckler and Brice Feillu. Voeckler again took maximum points and the Souvenir Jacques Goddet for being the first over the top of the 2,115-metre pass. On the third climb, the Col d’Aspin, Voeckler and Feillu worked together to stretch their lead while Chris Anker Sorensen of Saxo Bank and Alexandre Vinokourov of Astana started to chase as the big group splintered. The Aspin also brought the beginning of the end of Evans’s challenge for the yellow jersey and perhaps also for the podium as Ivan Basso of Liquigas forced the pace. Several BMC riders brought Evans back up to the Wiggins group but he lost contact again on the Peyresourde. Finally came the Peyresourde where Voeckler made his final bid, dropping Feillu just as it began to look as if Sorensen might get up to them. Behind them, Nibali did all he could, which wasn’t a lot in the grand scheme of things, and Sky shut him down. The others must wonder what they could have done differently. The reality is that whatever they tried would probably have been doomed to fail. Editor’s note: On stage 16, Voeckler had a handlebar-mounted computer, albeit well concealed, contrary to initially reported. On previous stages Voeckler has ridden without a computer. The point stands that he races intuitively.